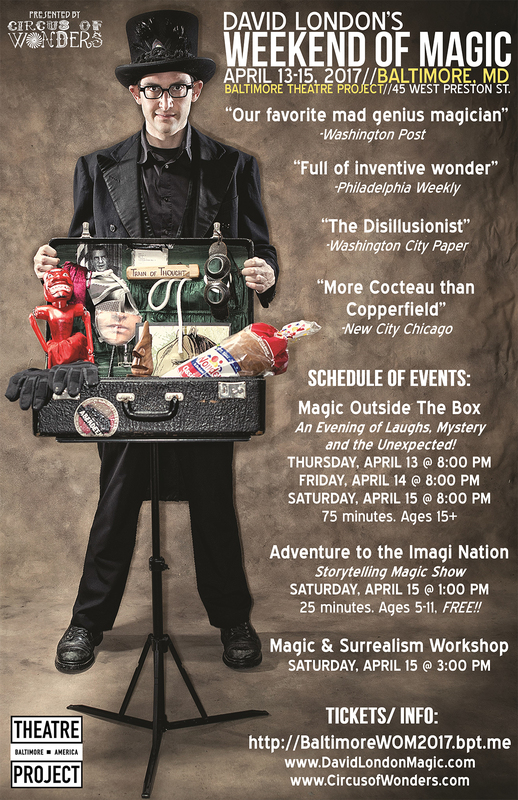 The Weekend of Magic at Baltimore Theatre Project will feature a three performance of David's Magic Outside The Box Cabaret Show , a Magic & Surrealism Workshop and a FREE performance of his family show, The Adventure to the Imagi Nation. Magic Outside The Box Cabaret Show: Join David London on a journey to someplace else. Featuring excerpts from his previous theatrical productions, this 75 minute show is packed full of laughs, mystery, and the unexpected! Recommended for ages 15+. 75 minutes. Tickets: $40 General Admission; $20 for Students, artists, seniors and wizards,; $60 VIP First Three Row Seating; $80 VIP Seating + Close-Up Magic Show at 7:15pm! The Adventure to the Imagi Nation Family Show: The Adventure to the Imagi Nation utilizes magic, storytelling, and interactive play to take children of all ages on a journey to the Imagi Nation a far away place found within each one of us. Meet the mayor, Take a ride in a hot air balloon, behold the phantasmata flower, and that's just the first 10 minutes! Recommended for ages 5-11. Fun for everyone! 25 Minutes FREE!! TICKETS AVAILABLE AT THE DOOR. : In David's mind, Magic and Magic Tricks, are two very different things. This workshop will explore both. Through a crash course in illusion, we will examine how we interact with reality. We will also discuss the intersection of magic and surrealism as well as play several surrealist games. You will go home with many more questions than you came in with, as well as several tricks and surrealist games to amuse, amaze and engage your friends and family. Recommended for ages 12+. 120 minutes. Tickets for the workshop are $25. AVAILABLE AT THE DOOR! About Circus of Wonders: Circus of Wonders creates and presents original circus, magic, sideshow and vaudeville entertainment for theaters, festivals, nightlife, and special events. We specialize in the design, creation and execution of original theatrical productions, large-scale interactive experiences, and custom live event packages.